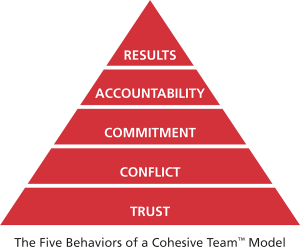 THE FIVE BEHAVIORS OF A COHESIVE TEAM is an assessment based learning experience that helps individuals and organizations reveal what it takes to build a truly cohesive and effective team in the most approachable, competent, and effective way possible. Powered by Everything DiSC®, the profiles help participants understand their own DiSC® styles. Bringing together everyone’s personalities and preferences to form a cohesive, productive team takes work, but the payoff can be huge for individuals, the team, and the organization. The Single Most Untapped Competitive Advantage: Teamwork! The ultimate goal of building greater trust, conflict, commitment, and accountability. “Teamwork ultimately comes down to practicing a small set of principles over a long period of time.” —Patrick Lencioni The Five Behaviors program is a framework that helps team members have deeper conversations about how they work together on a day-to-day basis. It’s a program that is rich enough for a team to come back to again and again. We work with teams who want to move in a positive direction. Contact us for more information.